“Smell that? You smell that? Black powder, son. 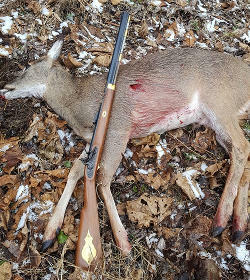 the smell of black powder in the morning ..... "
as the propellant in both muzzleloading and cartridge guns. I like to hunt bottoms at the mouth of narrow draws. Generally, they have a opening at the bottom where it's possible to ambush a buck. I had been into this area the week before and felt that there was enough sign to warrant a vigil. I left the pickup at the top in about 8" of snow and hiked a couple miles down an old grown up road that had been closed years before. The bottom was free of snow, with just patches here and there. From my previous visit I had located a place to set up in a clump of 2-3 little red fir saplings. If something came out of the draw, it would offer a longer shot than I was comfortable with off hand. I found a long limb that I laid between two of the saplings to use as a rest. I settled in to wait for dark or a buck, which ever came first. It was raining lightly and was just beginning to snow. Just at last light, this fellow came out of the draw at a trot. I made a grunt noise with my mouth and he stopped and looked in my direction. It was a hard quartering away angle when he looked back at me. It was well after dark when I made my way back to the rig and the next morning I went in with a mule to pack him out. I'm surprised being in the NW you can leave a deer overnight and not have it devoured by yodel dogs. Nice animal!! David, I've had more trouble with ravens than anything else. Course with the wolf situation around here now, need to get the meat out as quick as possible. Always leave some article of clothing and scent the area up some.